230(231-1) ... is the greatest perfect number known at present, and probably the greatest that ever will be discovered; for; as they are merely curious without being useful, it is not likely that any person will attempt to find a number beyond it. In An Elementary Investigation of the Theory of Numbers (1811), 43. The stated number, which evaluates as 2305843008139952128 was discovered by Euler in 1772 as the eighth known perfect number. It has 19 digits. By 2013, the 48th perfect number found had 34850340 digits. Dass die bis jetzt unzerlegten chemischen Elemente absolut unzerlegbare Stoffe seien, ist gegenwärtig mindestens sehr unwahrscheinlich. Vielmehr scheint es, dass die Atome der Elemente nicht die letzten, sondern nur die näheren Bestandtheile der Molekeln sowohl der Elemente wie der Verbindungen bilden, die Molekeln oder Molecule als Massentheile erster, die Atome als solche zweiter Ordnung anzusehen sind, die ihrerseits wiederum aus Massentheilchen einer dritten höheren Ordnung bestehen werden. That the as yet undivided chemical elements are absolutely irreducible substances, is currently at least very unlikely. Rather it seems, that the atoms of elements are not the final, but only the immediate constituents of the molecules of both the elements and the compounds—the Molekeln or molecule as foremost division of matter, the atoms being considered as second order, in turn consisting of matter particles of a third higher order. 'Die Natur der chemischen Elemente als Function ihrer Atomgewichte' ('The Nature of the Chemical Elements as a Function of their Atomic Weight'), Annalen der Chemie (1870), supp. b, 354. Original German paper reprinted in Lothar Meyer and Dmitry Ivanovich Mendeleyev, Das natürliche System der chemischen Elemente: Abhandlungen (1895), 9. Translation by Webmaster, with punctuation faithful to the original, except a comma was changed to a dash to improve readability. A neat and orderly laboratory is unlikely. It is, after all, so much a place of false starts and multiple attempts. For a smart material to be able to send out a more complex signal it needs to be nonlinear. If you hit a tuning fork twice as hard it will ring twice as loud but still at the same frequency. That’s a linear response. If you hit a person twice as hard they’re unlikely just to shout twice as loud. That property lets you learn more about the person than the tuning fork. - When Things Start to Think, 1999. 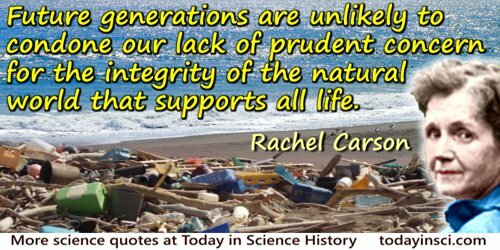 Future generations are unlikely to condone our lack of prudent concern for the integrity of the natural world that supports all life. I ought to call myself an agnostic; but, for all practical purposes, I am an atheist. I do not think the existence of the Christian God any more probable than the existence of the Gods of Olympus or Valhalla. To take another illustration: nobody can prove that there is not between the Earth and Mars a china teapot revolving in an elliptical orbit, but nobody thinks this sufficiently likely to be taken into account in practice. I think the Christian God just as unlikely. Letter (1958) to Mr Major. Collected in Dear Bertrand Russell: A Selection of his Correspondence with the General Public, 1950 - 1968 (1969), 41-42. In assessing Audubon, whose firm grip on the popular imagination has scarcely lessened since 1826, we must as historians of science seriously ask who would remember him if he had not been an artist of great imagination and flair. ... The chances seem to be very poor that had he not been an artist, he would be an unlikely candidate for a dictionary of scientific biography, if remembered to science at all. In Charles Coulston Gillespie (ed. ), Dictionary of Scientific Biography (1972), Vol. 1, 331. Sometime in my early teens, I started feeling an inner urgency, ups and downs of excitement and frustration, caused by such unlikely occupations as reading Granville’s course of calculus ... I found this book in the attic of a friend’s apartment. Among other standard stuff, it contained the notorious epsilon-delta definition of continuous functions. After struggling with this definition for some time (it was the hot Crimean summer, and I was sitting in the shadow of a dusty apple tree), I got so angry that I dug a shallow grave for the book between the roots, buried it there, and left in disdain. Rain started in an hour. I ran back to the tree and exhumed the poor thing. Thus, I discovered that I loved it, regardless. 'Mathematics as Profession and vocation', in V. Arnold et al. (eds. ), Mathematics: Frontiers and Perspectives (2000), 153. Reprinted in Mathematics as Metaphor: Selected Essays of Yuri I. Manin (2007), 79. The real achievement in discoveries … is seeing an analogy where no one saw one before. … The essence of discovery is that unlikely marriage of … previously unrelated forms of reference or universes of discourse, whose union will solve the previously insoluble problem. In Act of Creation (1964), 201. Those [scientists] who dislike entertaining contradictory thoughts are unlikely to enrich their science with new ideas.